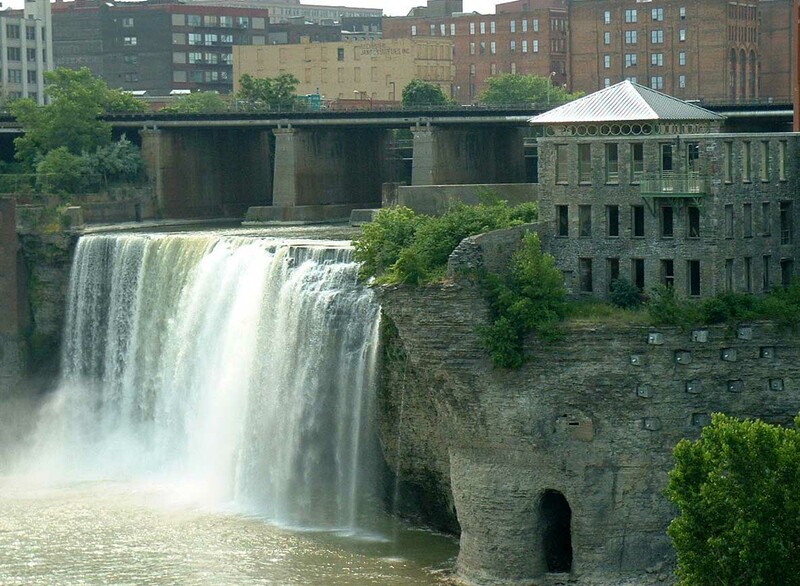 The power of the High Falls of Rochester was harnessed in the 1800s to grind wheat into flour. Rochester was the bread basket of America. 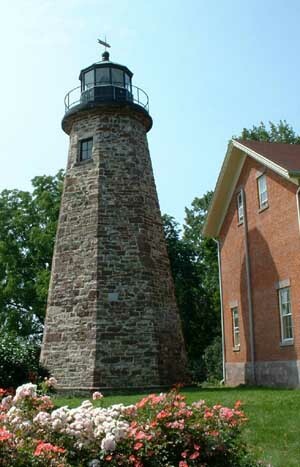 Perched on a bluff above the Port of Rochester is the 1822 lighthouse in Charlotte. The fast ferry to Toronto has reenergized this Rochester community of the lakeshore. The village of Pittsford is one of the canal towns near Rochester. 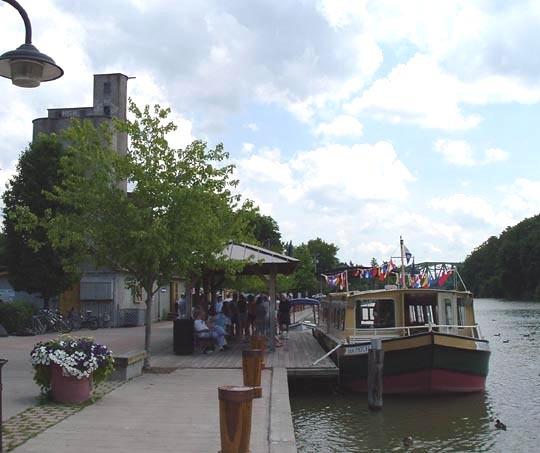 It has one of the most commercially successful waterfronts on the Erie Canal. Ganondagan State Historic Park (near Victor) celebrates the Seneca people who lived on this spot until the 17th century. 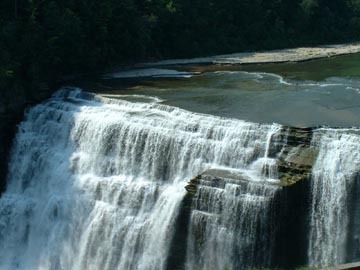 The highest waterfall on the Genesee River is the Middle Falls in Letchworth St. Park. Nearby is the home of the park's founder, William Pryor Letchworth, now the Glen Iris Inn. 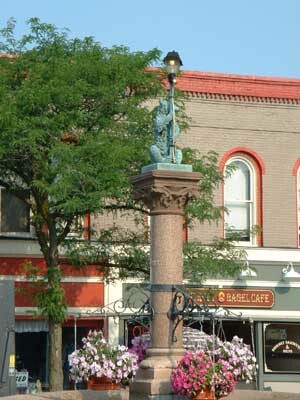 The Bear sits in the middle of Geneseo, an historic town overlooking the middle section of the Genesee River. 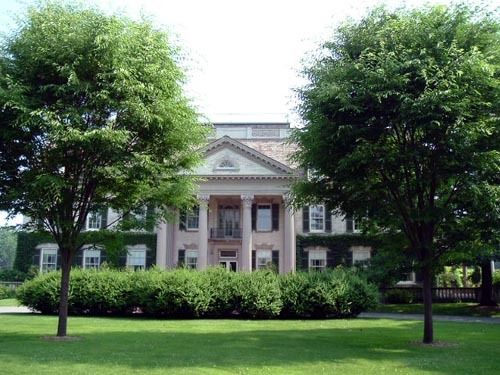 The George Eastman House, the home of the inventor of modern photography, also contains one of the best collections of photographs and old movies in the world. Only the Genesee River completely crosses the breadth of New York State. Its origin is in the Allegheny Hills of northern Pennsylvania. On its northerly course to Lake Ontario, it passes through many small towns (Wellsville, Belmont, Mt. Morris, Avon). Much of its route is peaceful, flowing quietly in a broad flat valley. But in the city of Rochester and in Letchworth State Park, the river plunges over a total of six waterfalls and has carved out two very scenic gorges. 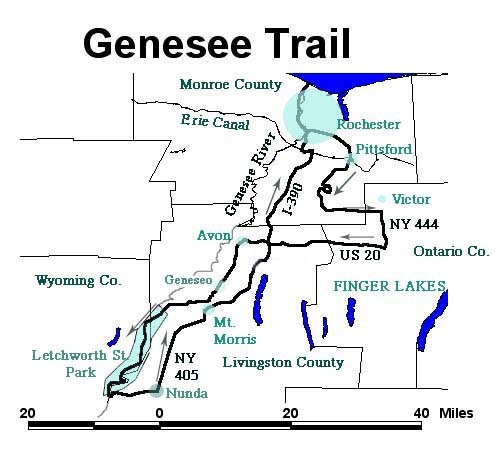 The Genesee Country is more than a river valley, however. There are neighboring communities that you need to visit during this road trip: Pittsford on the Erie Canal, Victor and the nearby Ganondagan State Historic Park, and Geneseo, the college town perched high above the river. The trip begins in the Flower City of Rochester, which, ironically, is where the Genesee ends. You begin the road trip in downtown Rochester on the Court Street Bridge. Here you get a nice view of the Genesee River and the old canal aqueduct (now the Broad St. Bridge). Beyond those Roman arches lie the three waterfalls within the city limits. To get to them you drive down State Street to the High Falls District. The best view of the falls is on the Pont de Rennes (Platt St. bridge). Don't miss stopping at the visitor center to learn more about Rochester as a milling center. Drive north on State. It soons becomes Lake Ave. When you get to Driving Park Ave., stop at Maplewood Park. You can enjoy the rose garden, and there is a trail that takes you to the Lower Falls. You are now in the middle of the Rochester gorge, created after the Ice Age. If you continue up Lake Avenue to the mouth of the Genesee River, you will be in Ontario Beach Park. Nearby is the famed Charlotte Lighthouse, and the ferry terminal (to Toronto). While in the park you should ride the classic carousel. Double back toward downtown. When you reach Kodak Park, turn left onto Route 104. It soon becomes an expressway. Follow it through Irondequoit. Take I-590 south, and then I-490 east out to the canal town of Pittsford. Stop here to stroll the canal at Northfield Commons. You can also take a boat ride on the Sam Patch. 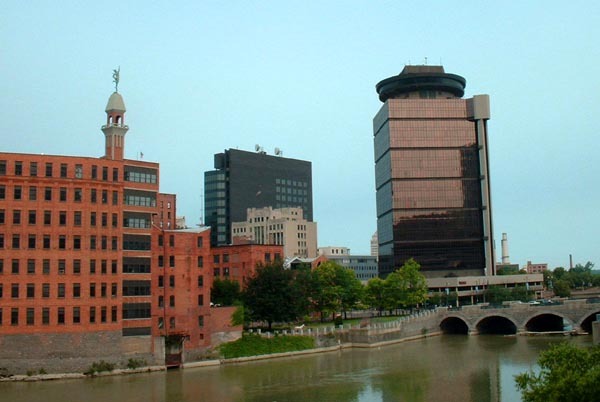 The Genesee River in downtown Rochester. The Broad Street Bridge now cars auto traffic, but a century ago canal boats came through here. The Devil's Bathtub, a kettle pond in Mendon Ponds County Park. Take Route 64 south out of Pittsford. After you pass underneath the Thruway watch for signs leading you to Mendon Ponds Park. 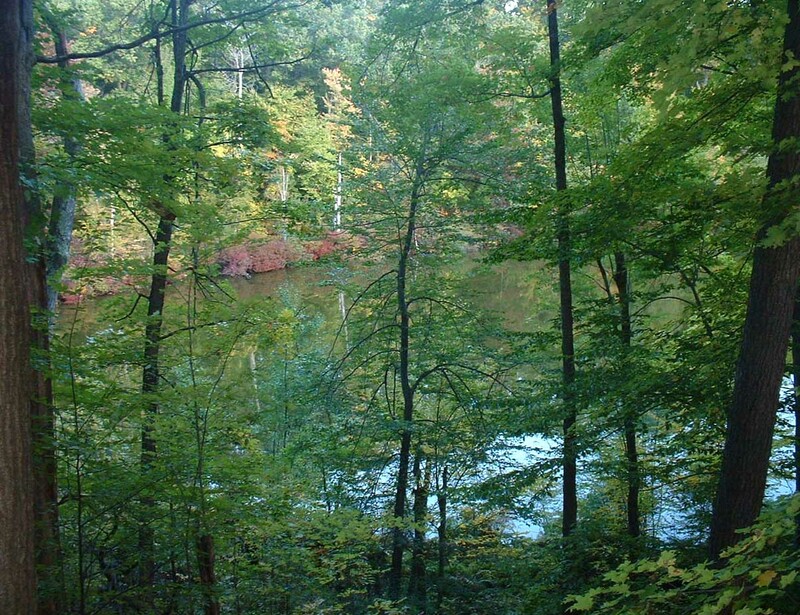 There are several little kettle ponds and glacial hills that making for easy hiking or boating. Exit on the west side on the park. Turn left on Route 65. this will lead you to the village of Honeoye Falls. Yes, there is a small waterfall here. Turn left on to East Street, which becomes Boughton Hill Road outside of town. Follow it through some gentle farm country. When you are in the Town of Victor, you will see signs for Ganondagan State Historic Park. Get out and explore the site where Seneca people lived 300 years ago. For a small fee you can tour the longhouse. As in other parts of the state, Route 20 is scenic. It goes over hills and down into valleys. You will pass through old towns of Lima and Avon. Just past the business district turn left on to Route 39 south. 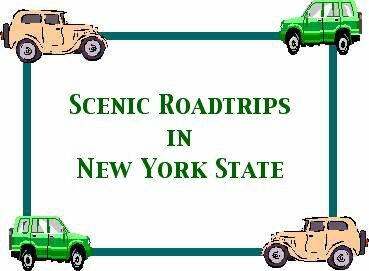 This road sits above the Genesee Valley, giving you some nice views as you approach Geneseo. This pleasant college town is worth exploring a little on foot. When you leave town follow Route 20A. It will take you down into the valley through Cuylerville and Leichester. Watch for signs taking you to Letchworth State Park (Rte. 36). The 17-mile drive through the park is one of the most spectacular in the state. You will see two different gorges, a flood control dam, a little museum, and three powerful waterfalls. You need to get out of the car and walk, even if it is just a stroll around the Glen Iris Inn. There are many places to picnic, and two swimming pools. You exit the park at the south end and enter little Portageville. Take Rte. 436 over the river and up a steep hill. You drive through quiet farm lands until you descend into a valley in the hamlet of Oakland. Here are the remains of five locks of the old Genesee Canal, that you can explore on foot. 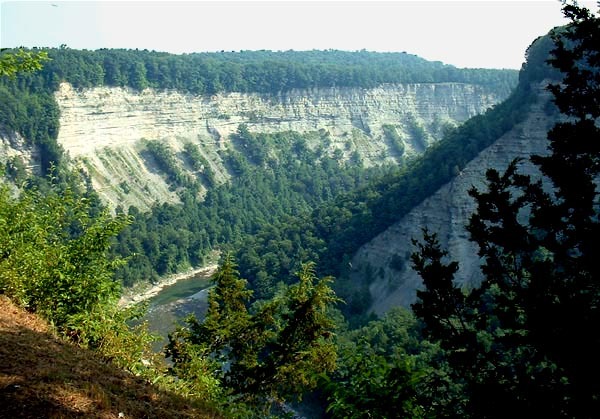 The Grand Canyon of the East: the great gorge of Letchworth State Park. 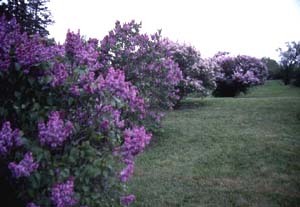 In mid-May the lilacs of Highland Park put on a fragrant and colorful display. The park is worth visiting at other times of the year also. Continue driving into the nearby village of Nunda, and turn left on to Rte. 408 north. This road leads you to Mt. Morris, where you can tour the dam. Outside of town you pick up I-390 north. Drive until you get to the outskirts of Rochester, and exit on to East Henrietta Road. Soon it becomes South Avenue, which leads you to Highland Park. Here you can tour the famous lilacs. If plants are not in bloom visit the conservatory. 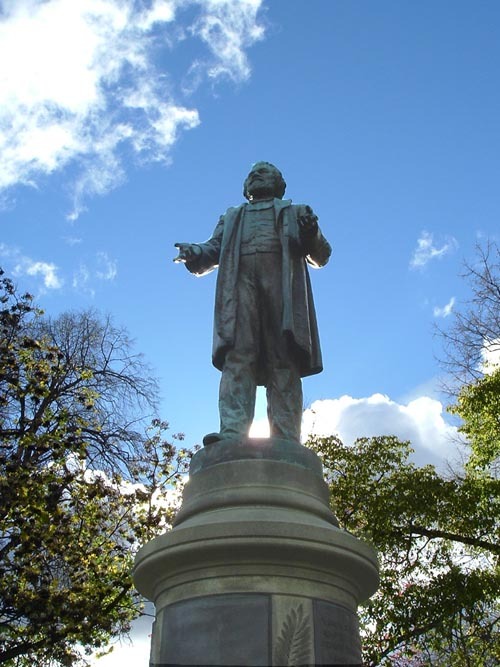 Also in the park is a monument to Frederick Douglass who lived here in the mid-1800s. Before ending your road trip stop at one of Rochester's outstanding museums, the George Eastman House, the Strong Museum, or the Rochester Museum and Science Center. They are easy to spot if you follow the Museum Trail.